Purchase the Standard /Limited Edition here. This game looks like an interest blend of action and strategy for an RPG? Would it appeal to fans of Dragon’s Crown, Odin Sphere or Grand Kingdom? AJ: Ahh yes . . . it’s a bit more fast paced than Grand Kingdom, in terms of strategic elements it’s more reflexive when it comes to planning out attacks for characters, or waiting for them to refill their gauge to block, so it kind of plays like a fighting game, but it definitely has a lot of strategy and resembles the feel of a game like Grand Kingdom or Odin’s Sphere. 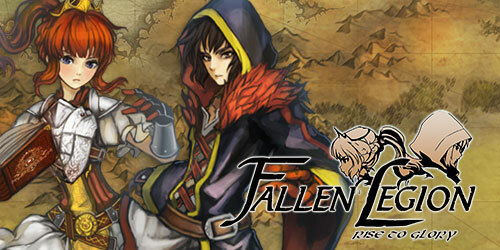 Fallen Legion: Rise to Glory is a collection made up of a VITA and a PS4 game. Is there any extra content over and above this? AJ: Yes, so there’s going to be extra stages, characters and even Japanese audio available for the game, so there’s definitely going to be a lot of new content for this title. This game features two storylines on opposite sides of war. Are there any differences in terms of gameplay for the two sides? AJ: The campaigns are different, but it’s not just the story it's basically two different games in their own right. How does switching between the two storylines work? AJ: You can select any of the two storylines from the start. Are there any new game mechanics that weren’t present in Birthdays the Beginnings? AJ: Yes, originally you use cube as a base for building your planet, but this time around you have the option of a tundra planet or a desert planet which is basically your difficulty settings his time around. There’s also a currency system that replaces the previous item discovery system where you had to fly your avatar around to get items, but this time around you just purchase them which simplifies things a bit more for players. AC: This adds a bit more of control to the experience, as before you were kind of hoping something would drop so you modify the terrain, but this allows you acquire the item you need. Is there a bigger variety of creatures? AC: Yes, there are new creatures that have been added to the game. How unique can be the creatures? Are there ones that are very rare and need very specific conditions to evolve? Are there any creatures that have never existed or are based on extinct species? Are you guys planning on other instalments? AC: That depends on the fans, we’d love to continue taking in the feedback from them and sharing it with the developers. Do you think your game could influence climate change awareness and educate? AJ: Believe it or not that’s actually something we tried to hit with the United States marketing. We worked with an agency briefly to discuss that as one of our directions. But I think that depends on how successful the game is; because it’s all about the wider audience it manages to reach.